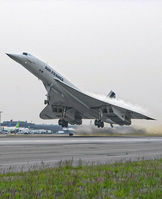 Image search results - "nce"
AIRFRANCECONCORDE_F-BVFC_JFK_0103D_JP_small2.jpgAir France Concorde performs the daily morning departure to Paris. This runway 31L departure is called the "Canarsie climb"
TBIT_LAX_1113DEB_JP_small.jpgThe biggest and best the world has to offer today. A380, 747-800, 777-300. AIRFRANCE_CONCORDE_F-BVFB_DTW_0599_MAIN_JP_small.jpgHaving just flown in on this beautiful airplane, I walked around it taking closeup shots, even though I've already done that numerous times in New York, I knew this would be the only time I'd ever get a chance to do this in Detroit!